This post is sponsored by Cottonelle. Thank you for supporting Baby Meets City! It's such a relief to finally feel settled in our new neighborhood. Though we only moved ten minutes north to Inwood (I could practically swim to the Bronx if I felt so inclined), the area feels quite different. Our building is directly across the street from a beautiful park & a playground that the girls love -- any NYC parent will tell you that is a serious game changer. There's a weekly farmer's market & a gourmet coffee shop. Tons of families. It's basically a small town feel in the big city, which is kind of bizarre and fun at the same time. Now, getting settled & organized inside our new home has admittedly taken a bit longer. Our new apartment is a wee bit smaller than our old place, so I've had to be a bit more creative with how we organize & store ALL OUR STUFF. It's funny, we threw out a lot when we moved (one of the few benefits of the experience) but we still have plenty to go around... how's that possible?! 1. You've seen the great Pinterest-y DIY of turning an over the door shoe holder into a toy organizer, right? I came across one I had during the move, and now I have all the girls' miscellaneous tiny toys & treasures organized in it. Brilliant! Can't say enough about that one. 2. Bunk beds. If you have more than one child & they share a room, bunk beds are such a great space saver. Plus, if it comes with a trundle underneath, the extra storage space there is WONDERFUL! I literally have all of the girls seasonal clothes packed away underneath, and more importantly, out of sight. 3. 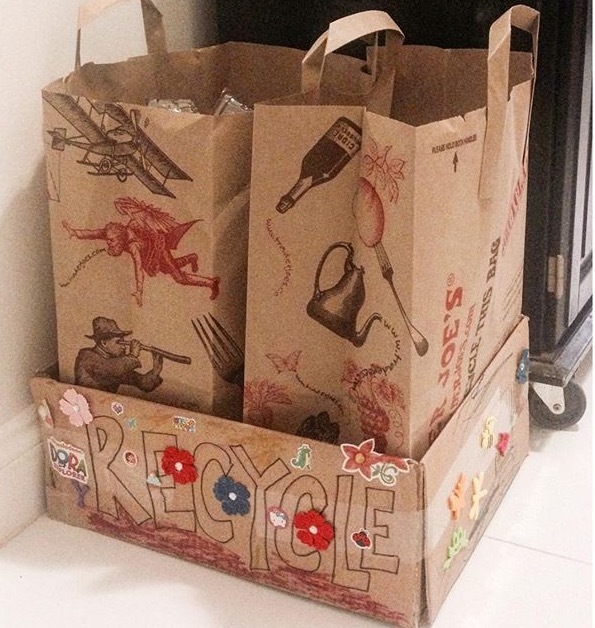 Set up a recycling station, and get the kids to help! The girls colored a box that fits 2 paper bags perfectly. Makes it so easy to separate out our recycling items & teach them a thing or two about saving the earth at the same time. Also, take it out daily to reduce clutter. 4. And finally, hello Cottonelle Megaroll. Literally, the mother of all toilet papers. The 4-in-1 aspect is the best part because we're not constantly changing the roll (in an apartment with 3 girls, that's saying a lot). I store a few rolls underneath the bathroom sink, and they're ready to go when we need them. But buying the Megaroll just means one less thing I have to shop for on a weekly basis.... which is what I had been doing prior to making this discovery. I'm not usually a "buying in bulk" shopper, but for this daily-needed item, it makes total sense. Click HERE for a coupon for 75 cents off your next purchase of Cottonelle Megaroll! Here's to the organized home, friends! Disclosure: This is a sponsored post with Cottonelle, and I received compensation. All opinions stated herein are my own. It's particularly hard to get kids into a good habit of keeping the house clean, not that I have very much experience with that sort of thing. But I can imagine that it must be quite a struggle most of the time. I should think that making cleaning up a more fun solution might be able to make it all a bit easier for the girls though. So perhaps a reward system in place too could help!